It has been brought to my attention by now 2 people and counting (at the time of writing), that some of you lovely people who have seen us perform and who follow us across social media, have received personal messages from a disgruntled former member of The Album Project. I am, as a general rule of thumb, decidedly against the airing of dirty linen in public. It’s an unedifying spectacle akin to watching a couple of chimps slinging lumps of shite at each other. As spectator sports go, I’d rather watch the upcoming 6 Nations this weekend. Or shin kicking. Or the national paint drying championships. “This is all very sad – It’s Simon having a go at me!” Nope… in fact current and former members of TAP and our affiliates have mentioned that they’ve never seen anything posted anywhere to corroborate this statement. I have spoken to as many of my fellow TAP band mates as I can to explain why circumstances have panned out this way. I have never, ever gone on to social media to bemoan the situation or have a good cry about it. “I don’t even know why I’m not in TAP any more.” This is false. A conversation was had over the phone, lasting around 45 minutes, where the reasons were given. I am not going to expand on what these reasons were. But the explanation was perfectly clear. To refute this smacks of a childish self-denial. “I’m booked as JK’s Chameleon to play a gig in 2 weeks at Goring, where I’ve always delt [sic] with the promoter.” This is true, I have never been involved in the booking of any gigs at this particular venue. I was recently invited by one of the venue promotion team to pop by for a chat on my way home from work. It was good to catch up, explain the band was on hiatus and had gone through a personnel change, and that maybe we’d able to perform there once more in the future. All very cordial and noncommittal on both sides. We’ve not been in touch since. “If I could post on the TAP group I would but Simon had blocked me… after all I’ve done [in running it] for the last 3 years. Sad.” The initial part of this statement is true. After I had taken the decision, as was my prerogative, to part ways and take things in a new direction, the individual concerned took it upon themselves to post a thinly veiled attack on me onto the aforementioned Facebook page, have a whinge about what had happened, portray themselves as a hapless victim, and then go to some length to advertise their new band plus gig dates all over that post without first having the courtesy to approach the page admin. The post was therefore removed, the individual blocked. Try demonstrating that brand of petulant behaviour on any other group page you may follow, see what happens. My bet is the result won’t be too dissimilar.The part about “running it” also had me confused. Did this mean running the Facebook page? If so, not true. It was set up by me, the individual was added as an admin at a later date at his request. This admin right was recently removed by me after I had made the decision to go on hiatus for the Winter. This was so that I could control the release of any announcement in the way I saw fit at the time of my choosing. To control the narrative without it being obfuscated by a meandering semi coherent ramble. However, “running it” could also have been referring to TAP itself. I would encourage you to treat that particular reality accordingly. “Folks should know the truth. I am not booking myself as TAP however there are several others out there who are! https://www.kickstarter.com/projects/tompjames/collaborate-the-album-project” That’s a pretty brave statement to kick this final couple of sentences off. And it is really why I’ve had to address things in this manner. The Album Project, by name, is plastered all over the events as a selling tool. Fair enough, up to a point. It’s the implication that there will still be a TAP feel or vibe to the shows, as though it is TAP in all but name (and drummer) that is misleading. There are a few top notch players involved, some really great guys I’ve been privileged to play with previously and hopefully will play with again in the future of TAP. But it’s a different band! And to say the individual isn’t booking out as TAP is patently false, the evidence is there if you look for it – myself and others found it and have proof of it. As for the statement that there are several others out there booking out as The Album Project, I had no idea as to the veracity of that claim. It could well be as stated, and I was intrigued enough to do a Google search, something I don’t actually recall ever having done before, although I may well have done back in the early days. The results were mostly of us, links to our Facebook page, YouTube videos, website hits etc etc. Then there was a jazz album by Various Artists released in 1977, a site for prettying up your scrap album, a site you can vote for your favourite classic album, and then also the site given as a link above. This goes to a Kickstarter page for a band named Collaborate from Southampton, UK. They want to raise funds to record an album of self penned Christian worship songs. And good luck to them, I hope they smash it! But as you can see, it’s not relevant to the argument of the individual making it. To suggest otherwise is at the very least misleading, and at worst a deliberate falsehood. So, if you’re still reading this piece, please accept my sincere apologies for having put you through this! We live in strange times, where “Alternative Facts” are given credence when they should in fact be treated in the appropriate manner. If you have in fact received a Trumpian styled message yourself, then you do now at least have enough of the other side of the story. I’m sorry to have taken up your time, thanks again for your continued support. Hello and welcome to this, my first ever blog post on our website! To be absolutely honest here, in trying to set up my login to the backend of the web page a few months ago, I made an absolute Horlicks of it and it ended up in a total bugger’s muddle. And in effect, I gave up on the whole sorry affair. But our resident photographer par excellence and web guru Mr Richard Olpin has once more exercised his remarkable powers in patience and taught me how to do it properly. Again. I thought I’d take this opportunity just to address a couple of issues that have surfaced over our Winter break. I really needed some time away from the band coal face, for many reasons – some band related and others personal. But now, as many of you may have realised, there has been something of a personnel change within the ranks of TAP. I really don’t want to go into the details as I feel it’s unnecessary and disrespectful to all concerned, no matter whose feelings are hurt or whatever resentment is felt. In the history of just about every band there has ever been, members come and go. It’s just the way of things. It happens. Think of your favourite band. Remember that member that left? Or was fired? Or went out for a packet of fags and joined a cult? Well, TAP is no different and we say goodbye and thanks to JK. We’ve taken this time out to plan ahead and decide where we want to take the band. And it definitely is “we” – just because I originated the concept of the band, there are no arbitrary decisions. I have canvassed the views of members past and present on our situation and future plans. Everyone has had a say and that is a good thing. We know the road we now want to take and we feel it’s going to be an interesting and exciting journey. There will be some familiar faces along the way, some new ones, and a big hairy fella sat at the back trying desperately to keep the time. An announcement will be made very soon about our September show. Thanks to everyone for your continued support, it means a great deal. http://www.thealbumproject.co.uk/wp/wp-content/uploads/2017/09/TAP-logo-480px-1.png 0 0 Simon Young http://www.thealbumproject.co.uk/wp/wp-content/uploads/2017/09/TAP-logo-480px-1.png Simon Young2019-01-28 23:45:422019-01-28 23:45:42The First Blog Post! It has been brought to our attention that a venue and another band have been using and trading on our name to promote a series of gigs they have booked. It would appear that this is a misuse of our intellectual property with the intention of creating the impression these events are presented by the Album Project. The Album Project wish it to be known that they are not associated with these events in any form, and neither do they endorse them or the band in question. The Album Project wishes to distance itself totally from those involved. http://www.thealbumproject.co.uk/wp/wp-content/uploads/2017/09/TAP-logo-480px-1.png 0 0 admin http://www.thealbumproject.co.uk/wp/wp-content/uploads/2017/09/TAP-logo-480px-1.png admin2018-12-18 23:54:122019-02-01 18:59:16TAP AGM? 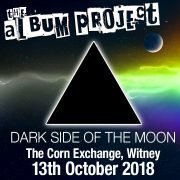 The dust has settled on our Beatles shows in Cheltenham followed by the Floyd show the following week in Witney and it’s now time to let you know what is happening going forwards. I came up with the idea for this band around 13 or so years ago. I could never remember the how or the why, but it had a long gestation. I subsequently discovered that it originated from a drunken conversation at a party with an old friend named Dave Sturdy. Ask me about it over a beer in the bar after a gig, it’s a fun story. His band, The Long Players, are based in Malmesbury and do their occasional one-off album tributes in a very different way to us. It’s a community of players, sometimes up to 40, all getting involved to raise money for various local causes. For them, it’s about the participation for musicians and audience alike. I’m happy to admit I unknowingly plagiarised the concept if not the methodology! But now, after 7 different projects in over 3 years, many gigs in various venues utilising 4 different PA companies, and most importantly benefiting from the expertise of 29 different musicians, it’s time for us to take a little bit of a break. These shows really take some organising and are incredibly time consuming. The commitment required from all those involved on stage is huge, and not just in the time spent at home learning the material. There is the rehearsal requirement which needs to fit in around everyone’s work responsibilities and other musical projects, the evenings and weekends spent away from home, the time spent travelling to and from our rehearsal venue deep in the Cotswold countryside. We do of course pay everyone for their performances but we are, unfortunately, not in the position to pay them to rehearse, or even to reimburse travel expenses. Looking ahead, I hope one day we may be in a position to remedy this. Everyone that has played in this band has gone above and beyond in their enthusiasm and commitment to what we do. I cannot praise them too highly or thank them enough. They are all wonderful people and I am forever indebted to them for their total professionalism and good humour. And that’s not even mentioning the friends of the band that have been with us along the way. They have also played a massive part in getting us to this point and I extend my heartfelt gratitude to them as well. This is NOT the end of The Album Project – far from it! Once batteries have been recharged we WILL be back. I have bookings already offered to us and pencilled in for the second half of 2019 and ideas are being considered for future shows. I’m already fairly decided on what the next one will be based on audience feedback. But these projects need to be more appealing to the musicians involved and therefore need a life outside of the venues we currently play. This means that in the coming downtime, some more planning and thinking about rejigging what we do and how we do it is in order. There are currently ideas for a couple of slightly different shows to go alongside our current format. I will of course announce these as and when we are ready to go. We just need a bit of a rest and a breather. I’d like to take this opportunity to thank you all for your support over the last 3 years. It has been a privilege to play for you. I can’t wait to play for you again. Thanks to Peter Foster for a great set of photos from the Led Zep IV show at Witney Corn Exchange last weekend! 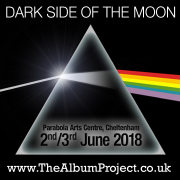 Dark Side of the Moon, Cheltenham – TICKETS ON SALE! http://www.thealbumproject.uk/wp/wp-content/uploads/2018/04/DSOTM-square-april.png 720 720 admin http://www.thealbumproject.co.uk/wp/wp-content/uploads/2017/09/TAP-logo-480px-1.png admin2018-04-17 22:51:382018-04-19 12:47:28Dark Side of the Moon, Cheltenham - TICKETS ON SALE! 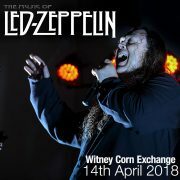 This afternoon, Album Project co-founder Jake Kirkpatrick was interviewed by Kat Ormon for BBC Radio Oxford about the re-launch of the Corn Exchange and the Album Project’s upcoming Led Zep IV show on April 14th..